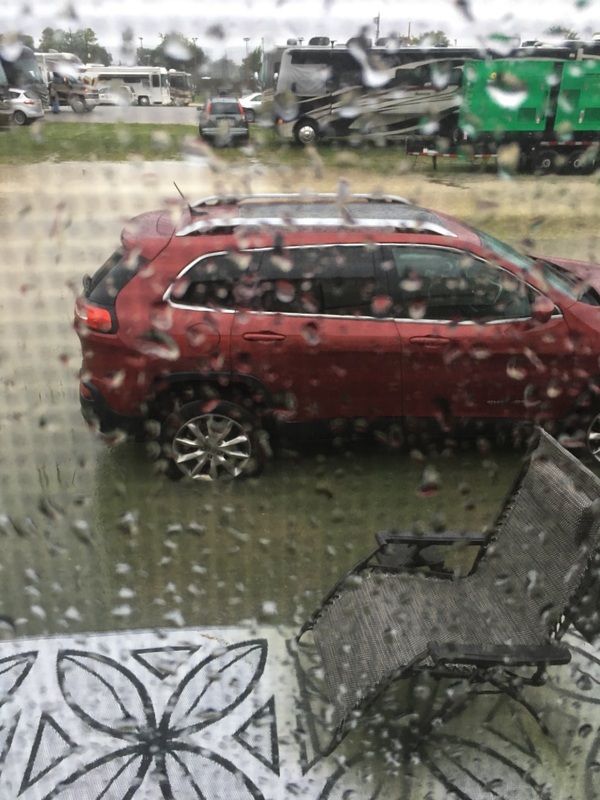 Rainy Day In Indianapolis – Let's Go RVing! During the night I heard the rain pounding the top of the RV and knew we were settling in for a rainy, stormy day and I was right. The entire morning was either a light rain or a heavy rain along with one good storm with heavy thunder and lightning. I had planned to ride my bike and then take my shower but the rain had surely prevented that. By 11:00 there were only a few people, very few walking around but most of them seem to be repairmen of some kind. While at FMCA rallys there are a number of repairmen who will work on your rig right where it’s parked. Very convenient. Yesterday we saw an awning repairman that appeared to line up about five coaches to work however due to the rain I doubt they are out and about today. Can you see the rain pouring through the rims of the tires? We just sat around the coach for the morning as there was no going outside but since I had signed up to volunteer I had a training meeting at 2:00. I talked Jerry into driving me over to the building since I had no idea where it was located and didn’t want to wander around in the rain looking for it. The fairground is enormous and it will probably take me until Saturday to find my way around. Fortunately I had my Hunter boots with me so with my boots, a rain jacket and a rain coat I walked out the door and when I stepped off of the bottom step the water came up over my ankles, probably about four inches. Thank goodness for my boots. Jerry took me over to the meeting which was brief and then picked me up when it was over. I will be working Saturday from 9:00 – 1:00 in the FMCA store. We won’t be handling any money, just helping people locate items. When I got back to the coach I just laid on the sofa and read and then there was a knock on the door. A neighbor a couple of coaches down asked if we were going to the dinner for the Volunteers so we jumped up and went. By that time I was looking like I needed to spend some time getting presentable but there was no time so off we went with Steve and Nancy from Illinois. The dinner was a good buffet and the Frustrated Maestros entertained with real golden oldies while we ate. Afterward we went all went over to play card bingo. Neither Jerry nor I had ever even heard of it before much less ever played but it was quite simple. We didn’t win anything but it was fun. By the time we got back to the coach it was after 9:00 and time to settle in for the night.